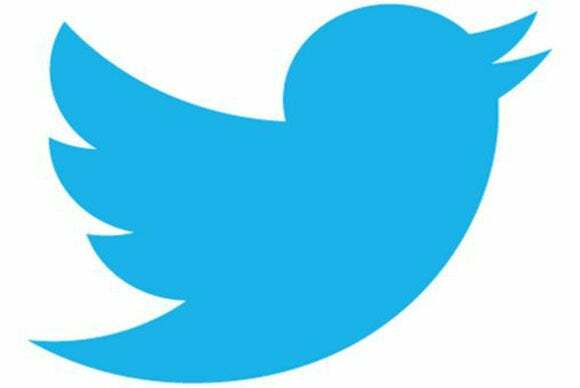 Twitter is useful for more than following your favorite celebrities. It's a powerful professional tool for keeping up on industry news, interacting with influencers, and marketing yourself. But when you use it this way, managing your Twitter account can feel like a full-time job—unless you have the right app, of course. Here are five iOS apps that make it a lot less work. Tweetbot 3 costs $5—far from cheap in the land of iOS apps—but it packs plenty of features to justify that price, starting with a super-slick design. Tweetbot makes scrolling through your timeline a pleasure, letting you view and dismiss links, pictures, and more with a flick of the thumb. Using the icons at the bottom of the screen, you can easily switch to view your mentions and direct messages. I especially like that Tweetbot lets you customize the last two icons with a function of your choosing; options are Retweets, Favorites, Mute, Profile, Search and Lists. Open the App Store, and you’ll see Twitterrific listed for free. But it isn't exactly, at least if you want to use all of its features. It will cost you $2 to go ad free and another $2 to activate push notifications. I’d suggest ponying up the $4 and getting everything Twitterrific offers, because once you do so, Twitterrific is, in fact, terrific. I like its big, bold layout in timeline view and how easy it is to switch between viewing your timeline, mentions, and direct messages using the icons at the top. 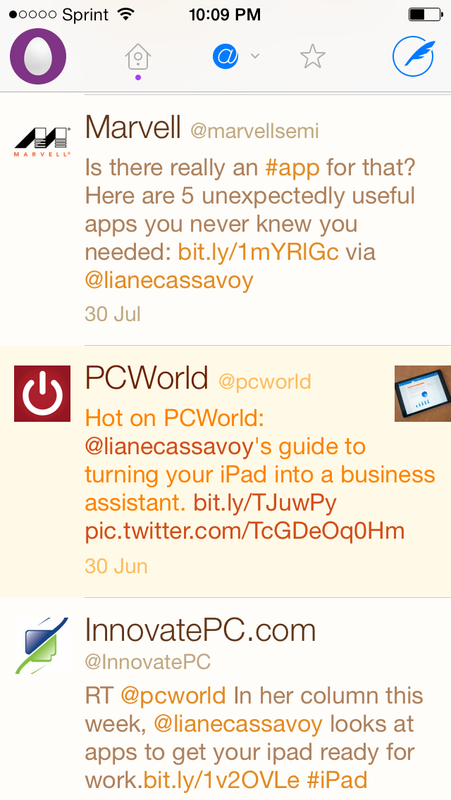 Echofon Pro packs a whole lot of Twitter into the small screen of your iPhone. 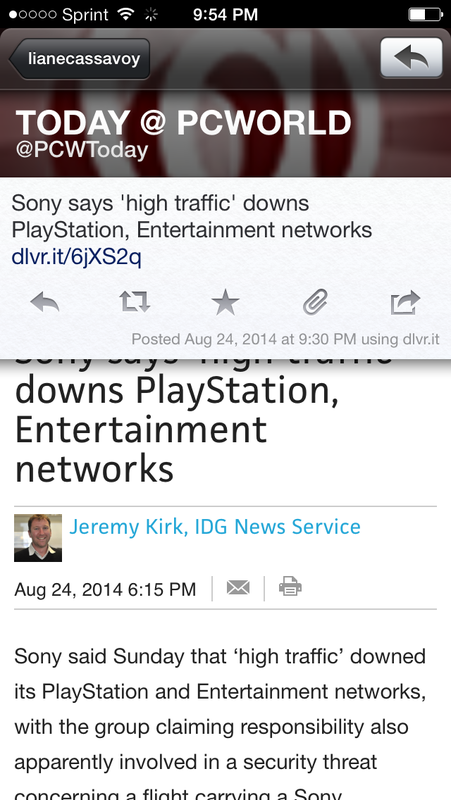 This $5 app features an interface that manages to display plenty of tweets at once but remain readable. The Home, Mentions, Messages, Lists, and Search icons that run across the bottom of the screen seem cluttered when compared with the streamlined designs of Twitterrific and Tweetbot—especially since they feature notifications that draw your eye right to them—but business users are likely to appreciate the full-featured approach of Echofon Pro, as well as its impressive speed. 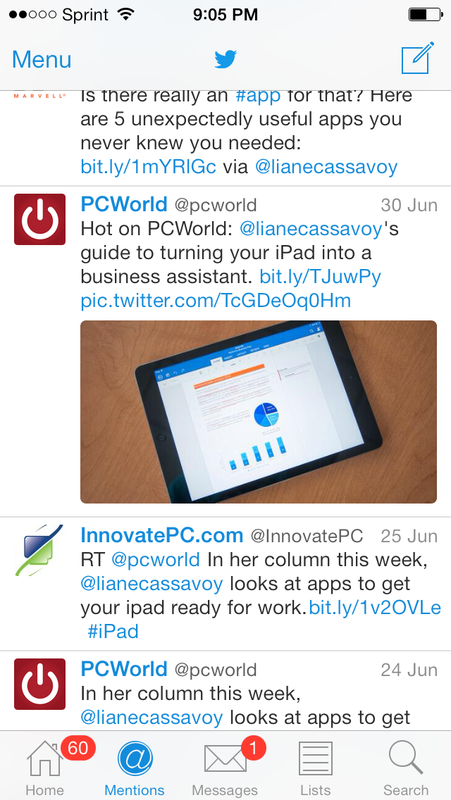 Tweet7 says it offers “the beauty and simplicity an iOS 7 Twitter app deserves.” It does so by delivering a streamlined interface: Tweet7 presents you with just your timeline and a button for composing a tweet. It also offers a field at the top for entering search terms. 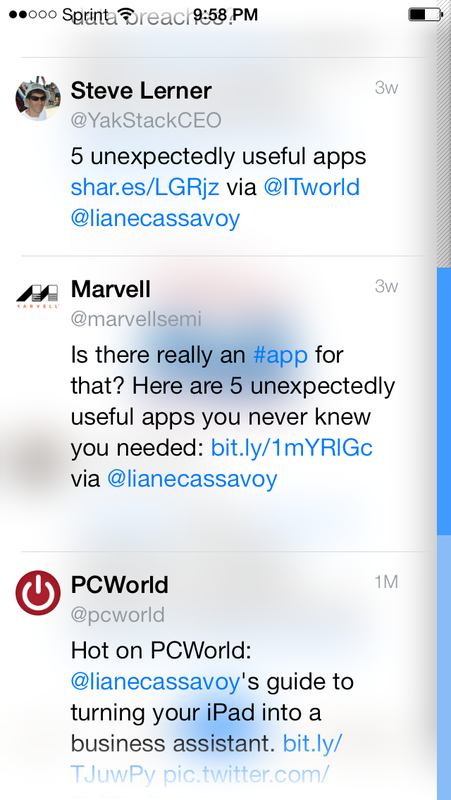 If you want to see your mentions, direct messages, or your profile, you simply swipe to the left. Business users looking for more in-depth features, such as list management or push notifications, likely will be disappointed in this $3 app, but anyone in search of a slick, simple Twitter solution will have all they need. Twittelator Neue bills itself as “the most innovative twitter app ever designed to fit in your pocket.” That’s a bold statement and one that’s hard to live up to, though Twittelator Neue makes a valiant effort. Its interface is sophisticated, but not simple—if anything, the smallish text and filled-to-the-brim screen make your timeline look a bit crowded. Things improve when you swipe to view a tweet, as Twittelator Neue displays an attractive timeline photo at the top of the screen and any linked content on the bottom. I like how easy it is to swipe left and right to navigate the app, too. At $5, Twittelator Neue isn’t cheap, and I’m not sure I agree it's the most innovative Twitter app yet, but it is a slick, sophisticated way to access Twitter. 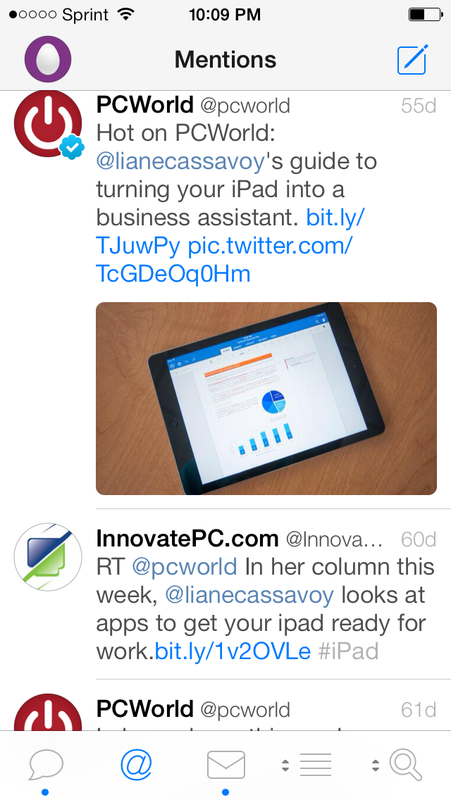 Liane Cassavoy is a veteran technology and business journalist. She contributes regularly to PCWorld and has written about business issues and products for Entrepreneur Magazine and other publications. She is the author of two business start-up guides published by Entrepreneur Press.